Edmund Edwards: She's a boy! David Barnes: Yeah, well we *knew* that. 'Soapdish' is one of the best, yet least well remembered comedies of the 1990's. The film revolves around the various off-camera drama's that occur behind the scenes of a cheaply produced Daytime Soap Opera. The first of the film's various impressive strengths is it's fantastic A-List cast. 'Soapdish' features some of the greatest actors and actresses of it's era. The film is superbly led by Sally Field, as the neurotic ageing actress Celeste Talbert (She famously throws a tantrum when put in a costume that makes her look like "Gloria F*CKING Swanson!"). Her supporting cast reads like a who's-who of 90's Movie Greats! 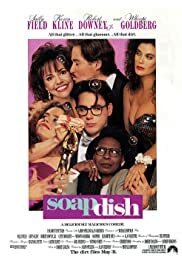 Whoopi Goldberg, Robert Downey Jr, Teri Hatcher, Kevin Kline and Kathy Najimy all elevate the film greatly. Goldberg is predictably excellent, whilst Downey Jr.'s and Hatcher's performances hint at the comedic excellence they would later achieve. In terms of writing, the film is outstanding. There is a really modern edge to the script, which strays into the wonderfully bizarre on several occasions. There also several visual gags that are quite ahead of their time. In some ways, the film is reminiscent of Mel Brooks at his best and frequently reminded this reviewer of 'High Anxiety' (1977). Much of the film's humour hinges on it's often scathing, but pretty accurate, representations of daytime television and of neurotic and pretentious actors. For example, The extras casting session featuring the exploitative executive played by Carrie Fisher, is both hilarious and honest. 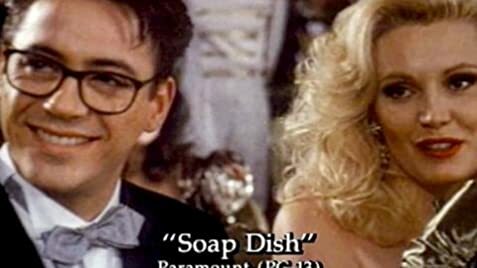 'Soapdish' is, for my money, one of the very best comedies Hollywood produced during the 1990's. It's excellent script and A-Class cast make it a must-see. It's hard not to love this film after it's kept you laughing for 90 minutes.